Spring! The earth is awakening, there are buds on the roses and geraniums, I can hear the tui in his jovial song in the tree next door, and my loan with Liberty Trust has come through! When I by faith trusted the Lord as my own personal Saviour, it was through the testimony and life of a fellow student midwife who was of Jewish descent. As I continued in a walk of faith she introduced me to the Christian Community camp living on Great Barrier Island where I was wonderfully baptized in the Holy Spirit, in the late 1960's. I met an adventurous little group of people who felt led to start up a community in Northland. It was God’s handiwork weaving phlegmatic, choleric, sanguin and melancholic personalities all together, learning to get along with one another and living in a large old hotel on the beautiful Kaipara harbour, doors open day and night, as God showed us, taking in any person in need plus children from broken homes. Babies were born there. People were nursed, and died there. We followed the New Testament Church of all things in common. Then after this season, the work was sold to YWAM and we all went our separate ways. As I had been living in community it took me some time to get used to the thinking of earning a living again, it seemed almost like a sin! Then eventually I was to meet up with the original leaders of the community again in quite different circumstances, only this time it was to buy their little cottage for $68.000 in the early ninetys, that they had back in Paparoa not far from the original hotel. As I lacked capital I needed to take out almost 100% loan, but the Lord was faithful and I was able to carry on giving, tithing, sponsoring World Vision children, working as a midwife, mainly on staff but also independent. Income was always there sometimes less, sometimes more. This is another sign of the Lord as a faithful Spiritual Husband to me, a comfort, as unmarried and no family of my own. I took a risk in 2006,when banks were loaning money indiscriminately and I took out another loan with Westpac and bought a home in Papakura, after shifting down from Northland and selling the first home to a Christian friend privately for $200.000. Owing to family commitments, I felt I needed to make a move to be closer to my wonderful mother. “Its very hard to break into the Auckland market, almost impossible” I was told by well-meaning friends. When I’m told “I cannot” a steely determination arises in me and so I set out and bought a property in Papakura for $280.000. Here again God is faithful, I had been overcoming my reticence as a country midwife and moved gradually to South Auckland that has the highest birthrate in the country, although my experience has been more postnatal supporting the mothers and their newborn, working for agencies. It was about this time I heard about Liberty Trust through a Northland Christian publication. It so captured my imagination as it reminded me when I lived in community. I felt this was the right thing to do, to apply to join Liberty Trust, and at this time I was invited to come on staff for the community Maternity unit near where I live, nearly full time. I was blessed when I was accepted into the covenant. So it seemed I was being led step by step. I threw myself into renovations and improvements, but was probably unwise in this purchase and should have simply downsized (I’m not good at that) and lived with our mother as, despite her unselfishness and long suffering it was becoming obvious to me she was needing more support, having reached the age of 97. 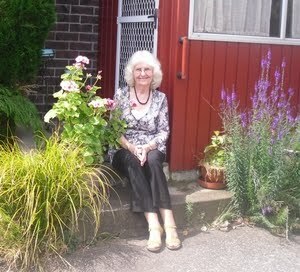 She had been living on her own since our father died in 1983, although Mum was rarely on her own much, busy looking after grandchildren, having lots of family visiting. I did at first rent it out with a good tenant but had a growing conviction that this was not for me. Time to sell although the market was down here again trusting in the Lords faithfulness and graciousness - I lost money as sold this home for $285,000 - despite renovations! Then there was the cost of land agents and lawyers fees. Once again the Lord has proven so faithful, despite my shortcomings. When Mum died after a short illness I bought her home privately at market value $310,000 (no land agent) so as to let all the family have their just portion. This what she wanted and asked me to do, but unfortunately I was undecided at the time and I’m sad that she is not here to see it done. As I live here, I think of how busy this little home was once, our kingpin has gone! That in itself brings its own sorrows, that is the problem with being a nurse, I set out to try and relieve suffering, but sometimes fail. I thank the Lord for forgiving my sins, healing my heart and memories. There have been times when I lost the vision, forgot the principles of the functioning of Liberty Trust. Thank you so much, Kerryanne and your team for your graciousness, when I have sent anxious misguided emails I am now in my late sixties (how did THAT come about??) After only about six years with Liberty Trust have been able to say goodbye to bank loans that were costing me $500-$600 a month. The bank loan was quickly and efficiently uplifted by Liberty Trust Lawyers. Westpac have been quite co-operative as I have always had a floating mortgage. With God’s help I trust I can keep to my conviction of the need to NEVER BUY MONEY AGAIN! Be ye strong, therefore, and let not your hands be weak: for your work shall be rewarded. 2 Chronicles 15 v 7.